Finding art for your walls can be a challenge, especially when you are working with a tight budget. This is one reason why I like finding ways to make my own wall art, but another is that your home ends up being that much more personal. So if, like me, you don't have a lot of money, but don't want bare walls, there are a ton of fun and inexpensive projects you can take on to create art for your home! This project, involving embroidery hoops and fabric scraps, happens to be one of them. See how the lady behind the lovely blog, Bluebirdbaby, made these in her home(scroll down the post a little ways). 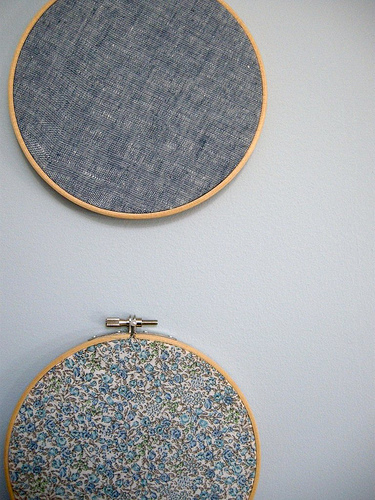 Very simply, first I bought some embroidery hoops at the thrift store for 25 cents each. Then, I dug through my fabric scraps and picked three of my favourite fabrics that also happen to go with the colours in our home. 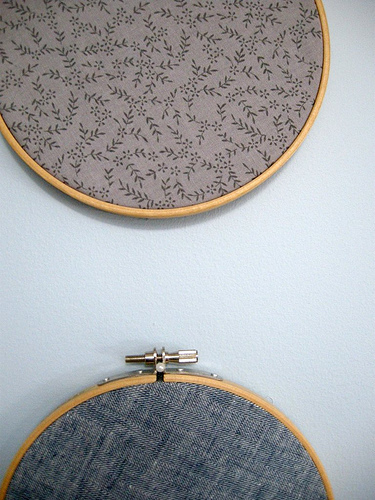 Next, I cut them to make sure that they were slightly larger than the embroidery hoops. A square is fine, I didn't worry about the cuts being straight, just as long as the fabric was big enough. Once I had cut the fabric I simply placed it in the embroidery hoop and tightened it. 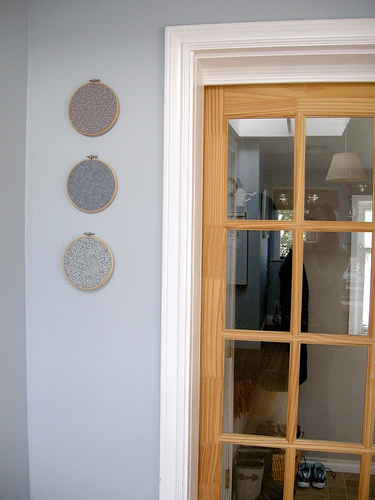 The final step is to hang the embroidery hoops and now you have some art for your walls! This project cost me a total of 75 cents as each hoop was 25 cents and the fabric I already had. If you don't have any fabric scraps you can always browse the discount bin at a fabric store! P.S. 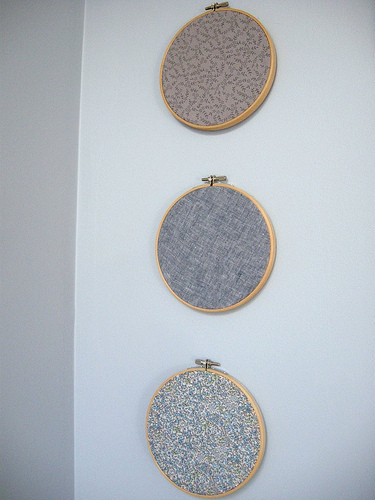 If you want another idea for personal wall art, check out this post!